There’s an inference in the quote above, that information you research is inherently different from information you know. Which, I suppose, may be true, depending on your definition of knowing. There are different types of information which feed into a book. The original advice to write what you know was never about all of that information. It was about themes. Write about ideas that you understand and identify with. That you know, intimately. The details: the characters, locations, events, back story, that’s what needs to be underpinned with a mixture of inherent and/or researched knowledge. There are also different kinds of research. Some can bring you closer to knowing than others. There’s a risk sometimes as a writer of experiencing everything from behind a computer screen, looking up facts, figures, descriptions and photographs. Where it’s just about factual accuracy, that’s exactly the kind of research we need. Last week I spent a few hours collating astronomical data and moon phases, and let me tell you, that is exactly the kind of task where the internet is invaluable. If you want to know when Jupiter aligned with Venus in the 18th century and what day of the week it was… no problem. But a lot of what goes into a book isn’t about factual accuracy, it’s about perception, capturing the essence of something. Consider location for instance. There’s really no substitute for first had experience of places. 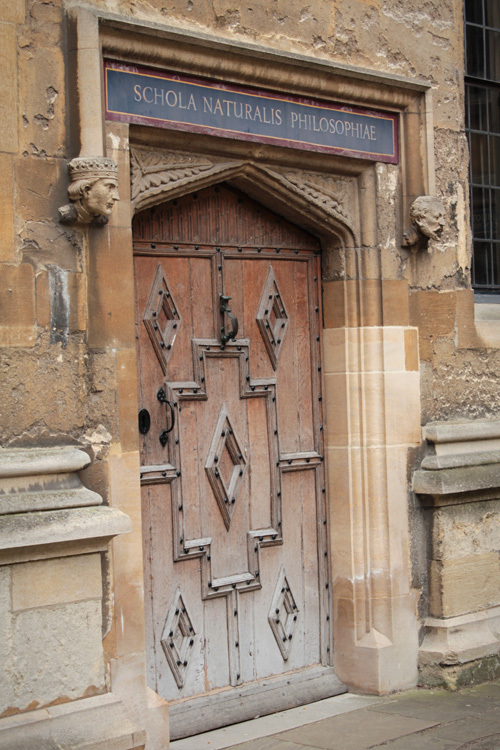 I took a trip to Oxford recently, to research locations for my current novel. None of the pictures I’d seen prior conveyed the shear volume of tourists and the constant frustration over parking and vehicle access. The Oxford in my book wasn’t going to believable unless my characters were constantly shoving through crowds of people aimlessly looking up at the architecture. If you need to describe a particular building from the outside, you might just about get away with streetview. But if you want to know what it looks like inside… well there things start to get difficult. Sometimes you get lucky. I found a conservation policy document for one of the buildings I was researching, which included pictures of all the restricted internal spaces, but even with the accompanying floor plans, it was still hard to work out how it fit together. On my trip I visited the building and went on a guided tour, and that gave me an understanding of it that far surpassed what I could get from pictures. The pictures helped me research it, but the visit helped me know it. Visiting the locations also created ideas. Once you can stand in a place, and visualise the scene, exciting new options suddenly begin to pop out. Previously invisible details present themselves for consideration. Actually going there might sound like a “well, duh” suggestion for location research, but many writers skip it, if only because their location is a fictional place that doesn’t exist. But, in a way, it’s almost more important to visit your fictional places. Your imagination remixes and recycles experience and blends it with abstract ideas. If you have no experience to draw on you’ve limited your potential already. Imagine your setting is a fictional forest on an alien world. You can’t visit it, but you can visit other forests here on Earth. Perhaps your location is a fictional factory; visit some other factories that do exist. You can find your location hidden a bit here and a bit there within the places you go. You can find it in the differences between what you imagine and what you see. What goes for locations goes for everything else: pictures and descriptions = good, field trips = better. That might sound daunting, but really it’s the best thing about being a writer! We get to try everything. We get to dip in, give things a go, observe, and then try to fake being an expert when we write. How renaissance. So my philosophy is “write what you know, and get as close as you can to knowing about as many things as you can.” Not only will it make you a better writer, but it’ll be crazy good fun. ← Previous Previous post: Story Cards – Microfiction on a Postcard! Next → Next post: Is it Okay to Stop Reading a Book?